Billions of dollars in investment capital are waiting on the sidelines, watching the global marijuana industry boom. And that money will continue sitting the game out until Congress takes action to resolve the fact that marijuana is illegal at the federal level. That’s the core message from deep-pocketed investor Kevin O’Leary, a star on the popular reality TV show “Shark Tank” whose personal net worth is over $400 million. O’Leary has an investment portfolio that spans several continents and hundreds of businesses, and his central message to cannabis entrepreneurs is simple. “The whole energy of the industry should be towards resolving the federal mandate,” O’Leary told Marijuana Business Daily. 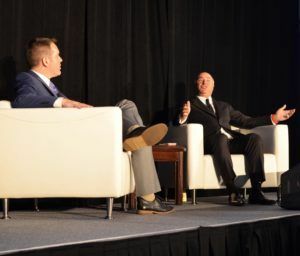 O’Leary – who is a keynote speaker at MJBizConNEXT May 9-11 in New Orleans – talked with Marijuana Business Daily about some of the trends he’s witnessed in cannabis and what he sees in the future. You’ve said you’re hesitant about investing in the U.S. cannabis industry. Changed your mind yet? As an investor, you want to understand the laws both at the state and federal level. You don’t want to go awry of that. We still have that problem with recreational marijuana. And that will always be a challenge for institutional capital until that gets resolved. But given the change in tone regarding the use of cannabis for medicinal purposes, I’m very encouraged that that will be the path to a federal mandate first. That’s why there’s so much (investor) interest in this space … not just domestically; globally. There’s all kinds of opportunity in countries that grow, countries that have technology, countries that are going to transfer that technology here on a licensed basis, all of that. Any investing tips you’d offer for people who are already investing in the cannabis industry, either in the U.S. or Canada? You have to be quite tolerant of volatility, because if you’re in public stocks that are involved in cannabis, you have tremendous volatility in headline risk. And you also have a nascent industry, so cash flows are uncertain in many situations. So, in terms of return of capital, in many cases that’s an unknown. But the promise of this industry is to take a product that’s been illegal for decades, put it into a structured, legal-mandated program and it becomes a major cash flow, a public good for taxation purposes. It’s akin to the tobacco industry, which went through decades of regulation and litigation, and it’s come to a place now where it seems to have found a static place in society. Obviously, there are major medical issues regarding (tobacco), but it’s heavily taxed, it’s heavily regulated and it’s important that it’s kept out of the hands of minors. And I think some elements of the legal marijuana industry are going to follow that mandate. What tips would you give cannabis entrepreneurs who are seeking funding? They should focus on the states they’re operating in, to find local investors that don’t have a concern about federal compliance. There’s nothing illegal about investing in California if you live there. There’s a tremendous amount of interest in this space, like I’ve never seen before. This is a sector that has the whole world looking at it, all the pools of capital looking at it, all the sovereign funds looking at it, everyone’s looking at it. … There are billions of dollars that want to invest in this space. I go right back to how we started – I can’t push hard enough on this button: The industry must get a federal mandate, and the way to get that is to differentiate the recreational use of this drug from the medicinal opportunity. The path to take is to get a federal mandate for medicinal oral consumption, or other ways of consuming, but get away from this idea that you have to pursue medicinal use the same way you pursue recreational. Recreational is going to have a much harder time. Do you think Canada will actually legalize recreational marijuana this year? I would have said a year ago that the probability was 90%. I don’t feel that way now. To me, it is not a slam dunk. It is a risk. And that’s why the Canadian stocks are really worth looking at. Look at the volatility. Look at any chart of a Canadian publicly traded marijuana company, and you see the ebb and flow of concern. The Canadian economy is so intertwined with the U.S. – Canada is the No. 1 trading partner for 38 (U.S.) states, responsible for millions of jobs. Generally, you haven’t ever seen controlled substances legalized in one country when they don’t have a mandate in the other. This will be one of the first. How do you think the global cannabis industry will be impacted if Canada does legalize marijuana? Canadians, just like in the mining industry, sort of lead in developing new platforms in all kinds of countries around the world. They’re the most advanced in that. And the same way in this new industry (recreational cannabis). But at the same time, it’s very hard to attract institutional or sovereign capital to this space. This space needs billions of dollars to build out its infrastructure and logistics. Many scientific studies on the use of marijuana have been done since the late 1800’s & been acknowledged for their excellent benefits to those in need. However, the government chooses to ignore them & side with the giant corporations that run the country. When are the American citizens going to be recognized as the ones who run the country & not the lobbyists & special intersts who control it? Great Article. We need access in all states for Medical Marijuana. Kevin O’Leary hitting home the point, nothing is technically legal which is why it’s hard to move on the topic. Point of interest for everyone, from Trump to Session, Rohrbacher to Cole Memo, that the only thing that is really important to the WHOLE industry-including Hemp- is to focus on changing the federal mandate. Otherwise all of this is for naught and goes nowhere! This is the type of commentary that leads to the volatility in the Canadian MJ markets. Positivity is a critical requirement to boost and support public opinion. On the contrary, he’s right on every point. Everyone’s looking at the MJ market but mainstream money can’t and won’t touch it until it’s federally legal. They live and die by risk and right now, it’s still too risky. And look at the market, yeah there’s been some compression in prices and a bunch of people with high hopes and no experience with shallow pockets have dropped out, but the markets are still going strong everywhere it’s been legalized so far. That’s about as positive a sign as anyone would ever want to see and it’s also why all of the investment community is watching so closely. So in short, it’s all good. Lets take the first step by supporting Mitch McConnell in the bill he says he will introduce to deschedule hemp…at least that’s what was in the news last week. Legal for medical use and illegal for recreational use only supports the black market and its associated losses. If the government isn’t going to make cigarettes illegal then they should not prohibit the sale and consumption of cannabis in flower/bud form. That is coming from a person who prefers Vape products. The hipocrisy of legal alcohol and illegal cannabis is astounding. It’s strange because I just received a US Patent on Smokeless Cannabis composition and manufacturing process. I’m looking for investors at this point but Sessions has everyone spooked at this time. I have a great portfolio folio in Massachusetts and we’re in fund raising mode if you wanna take the ride! Yes, understand the law at state and federal level. /Then invest in foreign companies that have the jump on America/. California is a powerhouse that can easily dominate the global marketplace, but as long as Uncle Sam has them locked into their own wheelhouse, revenue streams will be established elsewhere. The longer the US federal government dillydallys, the less money we’ll bring in at home. Period.